Judici­al tribun­al to invest­igate illega­l allotm­ent of land in Gwadar is yet to begin its hearin­g. 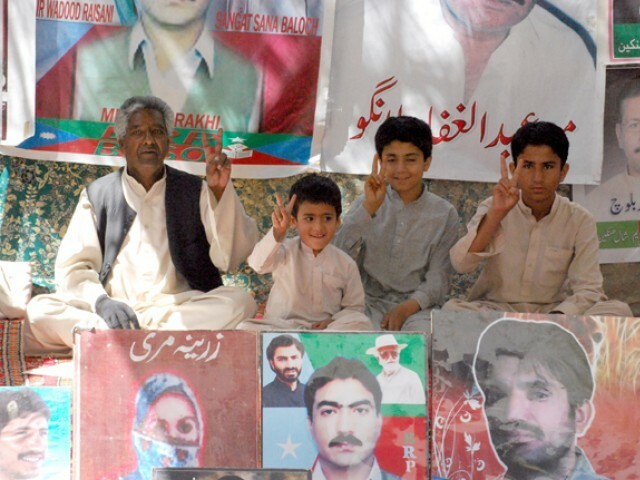 Two years after the much-hyped Balochistan package was announced, the province continues to count its missing persons and the only ‘recovery’ has been of bullet-riddled bodies. Considered one of the major achievements of the PPP-led government, the parliament had unanimously approved the package on November 23, 2009. Although some administrative and financial issues have been addressed, the insurgency-affected province is far from normal. Burning issues, including the recovery of missing political workers, return of self-exiled Baloch leadership, investigation into the killings of Nawab Bugti and three Baloch political leaders Ghulam Muhammad Baloch, Lala Munir and Sher Muhammad, are far from being resolved. Rehabilitation of internally displaced Baloch tribesmen, who had fled Dera Bugti and Kohlu during the military operation in 2006, has also made negligible progress. The government had made a judicial tribunal to investigate the illegal allotment of land in Gwadar, but it has yet to begin its hearing. However, promises of employment have been met to some extent with 5,000 people inducted into the provincial education department. The Nationalist Party (NP) believes the package did nothing to address long-standing grievances of the province. “How can we seek prosperity and peace when basic problems are not resolved? From the very first day, I had said that political opponents that were subjected to enforced disappearances must be recovered and negotiations with angry Baloch leaders must be held,” said NP President Senator Dr Abdul Malik. “Instead of releasing missing persons, bullet-riddled bodies are being found dumped in every corner of the province,” he said. Despite the government’s offer to negotiate with their ‘angry Baloch brothers’, self-exiled nationalists, including BNP Chief Sardar Akhtar Mengal, Brahamdagh Bugti, Hyrbyair Marri have not returned to the province. Federal Minister Dr Ayatullah Durrani sees political reasons behind the delay in their return. “A preliminary board comprising influential leaders, local elders and other stakeholders has been established to hold negotiations with self-exiled Baloch leaders and get them to return to Pakistan,” he said. The minister insisted that most of the points in the package had been implemented, while the remaining issues were being addressed. Commenting on rehabilitation of Internally Displaced Persons (IDPs), Durrani said: “Balochistan is a tribal society and there are differences between tribes that hinder rehabilitation of IDPs.” The government, however, is making its utmost effort to rehabilitate the affected Baloch, he said. Despite assurances of removing all checkpoints in Balochistan, a number of them still dot highways and cities. When Durrani was asked about the presence of checkposts, he said they were set up to maintain security and avert attacks. Last year, Chief of Army Staff General Ashfaq Parvez Kayani converted the Sui Cantonment to an education enclave. “There is no army unit in Balochistan and all of them have been replaced by paramilitary troops, the Frontier Corps (FC). The FC is called in any district on the request of the deputy commissioner and provincial government,” the minister said. The nominated accused for Nawab Bugti’s murder case are yet to be arrested despite the issuance of arrest warrants, while investigations into the killings of nationalist leaders Ghulam Mohammad Baloch, Baloch National Movement’s Lala Munir and Baloch Republican Party member Sher Mohammad Baloch are yet to begin. Dr Malik said the government has to prioritise the issue otherwise its initiatives will have no impact in troubled Balochistan. Deceased were identified as Faraz and Umeed Ali who had bullet injuries in their head. Ministry claims numbers of youth nominated increasing. Total body count from two days rises to eight. Levies personnel recovered the mutilated bodies on a tip-off. Apex court refers chronic cases to judicial commission. Same is true for Kashmir, Assam, Jharkand, Tripura, Nagaland and Khalistan. You forgot the other 20 something states! And, Khalistan? Are you even aware that a Sikh is the PM now? Kashmir saw the highest influx of tourists last year in the past 20 years. The business is booming. That doesn’t sound anything like Balochistan. By Grace of God we have a Baloch President of Pakistan, A Baloch Governor, a Baloch CM and Baloch Chief Secretary of Balochistan. Balochistan is a place even the Chinese are afraid to venture. They are too scared to build the Gwadar port, even though it would be advantageous to them. If you keep your head buried, things will only go down hill. Listen to an Indian, we have been predicting Pakistan’s present status since decades. How right are we!